Here is the accordion pocket I promised! I am loving how it adds just the right amount of interest to a pocket. 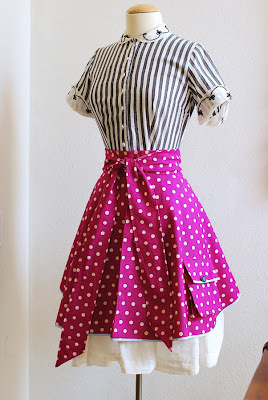 You can add them to jackets, skirts, and as demonstrated here - aprons. Below is the pdf pattern to make an accordion pocket. Along with the instructions, I've also included the pattern pieces. Just print out the pattern and tape the pocket pattern sheets together to make the pocket template. You can also download the pdf from my website's tutorial page (here). Note: be sure your printer is not set to "Scale to fit" when printing. If it is, the printer will shrink the pocket pattern pieces when it prints. Don't forget to enter the giveaway! It closes tomorrow evening, so click on over if you haven't already. 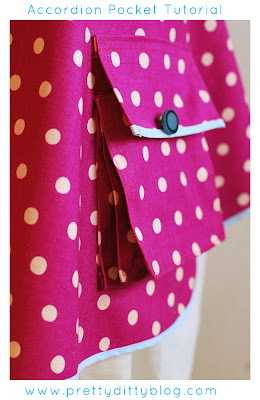 Such a darling pocket...and, your sewing is perfection! Thank you for sharing your exceptional tutorial! I love this turotial too so so much! Thank YOU very much. 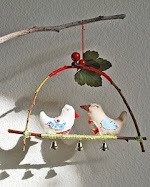 :) I've been feeling under the weather lately and it didn't allow me to blog, blogs visit and craft. I am hoping to get back into the swing of things soon...this tutorial came at such an awesome timing. Love to you! Not sure if I'd ever wear an apron but I can see application of this on cargo pants.